Content information and Photos by Duncan Kirkwood, Peterborough UK. Duncan photographed this interesting Buick at the Kettering Vintage Rally & Steam Fayre in September 2015 where he met the current owner, Alan Croft from Northampton. The car is based on a 1918 Buick “E” series six cylinder chassis and running gear and displays numerous modifications including a brass plate on the footplate stating “Buick Racing Car and Number 11 of 50” or something very similar, which seems to give the impression that this was is a factory built model. This is very unlikely as there are no historical records of Buick building race cars after Durant lost control of Buick in 1910. In fact the Bankers, who then took control of General Motors for the next five years, immediately closed down all of Buick’s racing activity. In England the independent importer Bedford Motors Limited, who sold Buick chassis with locally built bodywork under the marque name of Bedford, raced some of the American built Marquette-Buick race cars at Brooklands and also in other events. 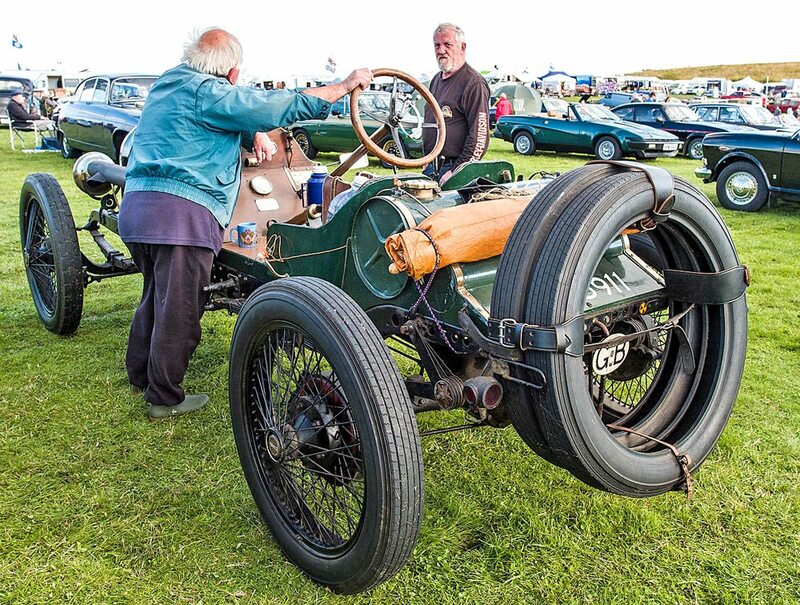 In late 1912 GM took control of Bedford Motors Limited continuing to sell English bodywork on Buick chassis with the marque name of Bedford Buick. Support for UK racing continued until disrupted by the Great War. 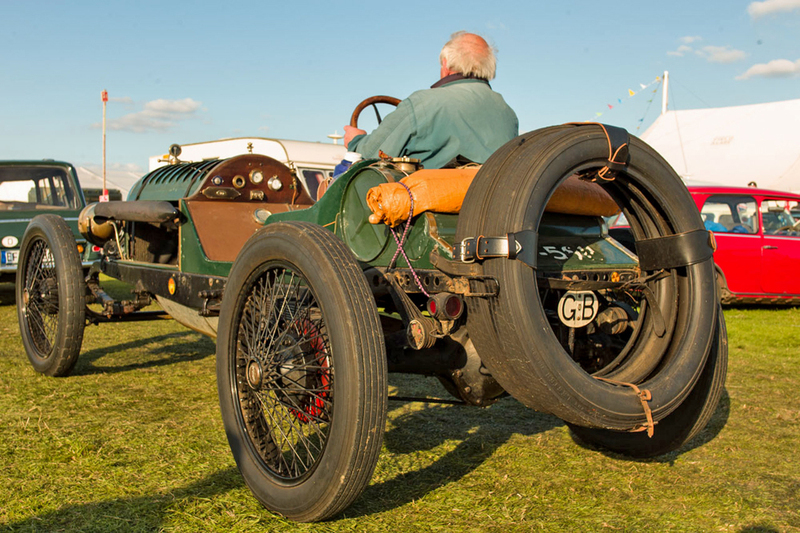 Because of the war, Buick’s English body building ceased in 1915, then in early 1916 all car imports into the UK were prohibited without a licence by the British government and the prohibition lasted until relieved in late 1919. Buick cars and chassis continued to be imported through the prohibition period but only for use by the British Government or for Military use. At McLaughlin Buick in Canada, where the subject chassis was built production was directed to the war effort and at Flint in the USA the Buick works were similarly focused. 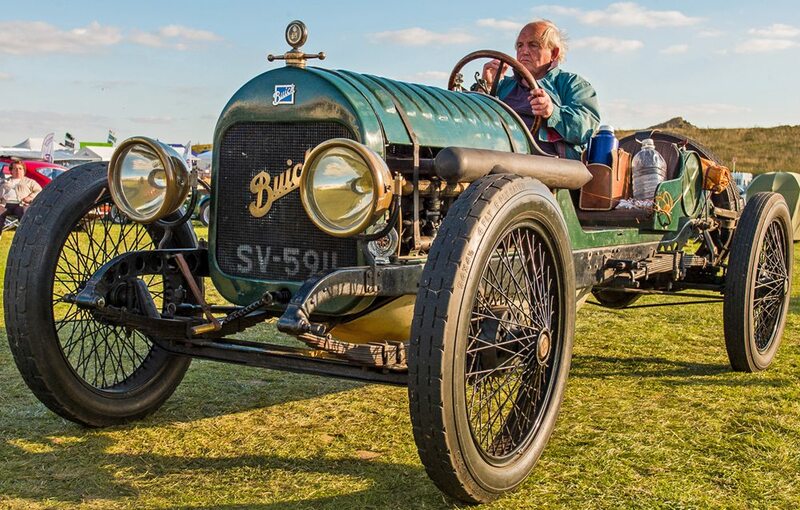 Buick imports into the UK available for sale in the open market resumed during Buick’s 1919 model year. 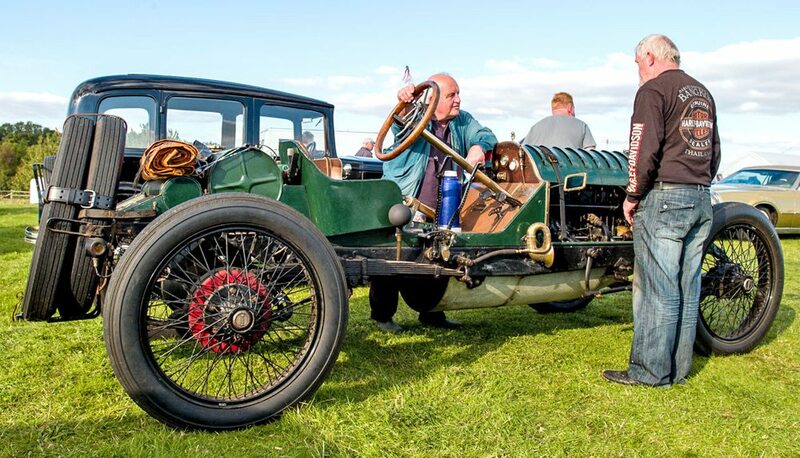 What all this tells is that this 1918 Buick Racing Car was not factory built in either North America or the UK. None the less it is a very interesting vehicle designed along the same lines as the factory built Marquette Buick racing cars of the prewar period. In 1919 the British Government sold off all their war surplus which included Buick vehicles and running chassis not yet converted into military ambulances. 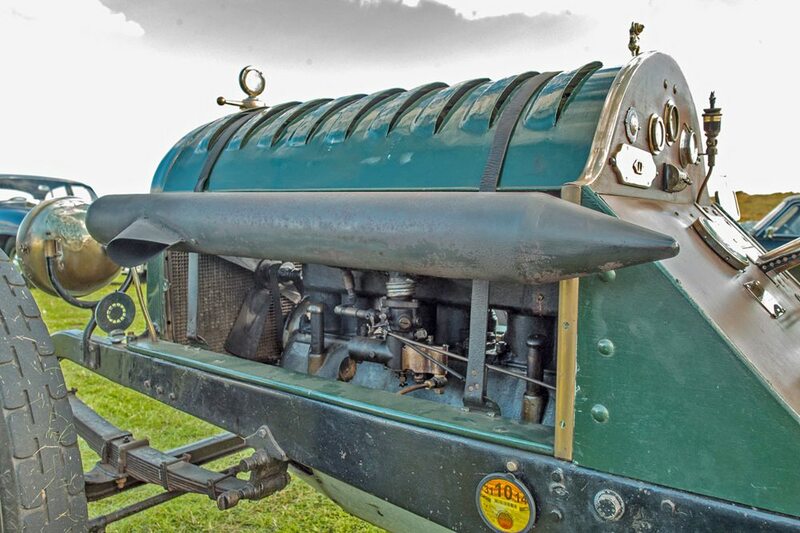 Perhaps its basis came from this stock or it could have been built at a later time on a 1918 chassis. 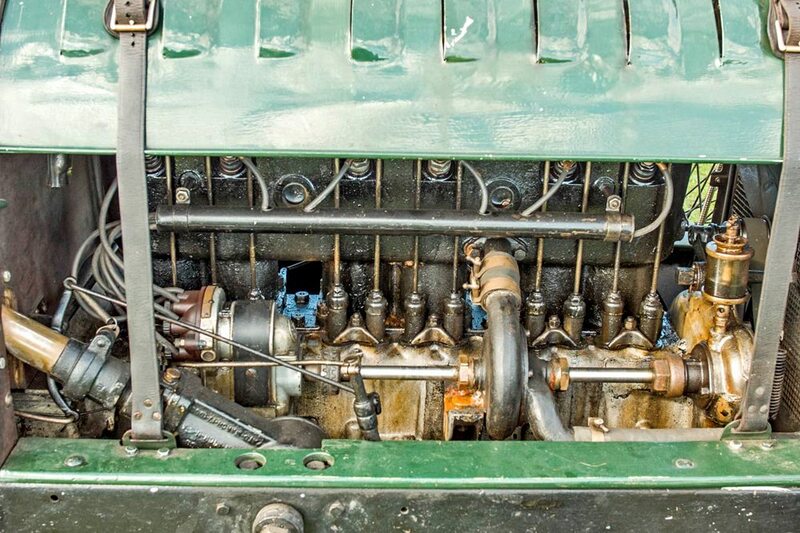 There is little doubt that its chassis and running gear is 1918 Buick “E44/45” series RHD export chassis but the modifications point to the prewar period. Buick’s standard fit 1918 Delco 6V starter/generator and distributor has been discarded in favour of magneto spark, requiring the non standard fixed cranking handle as the means of starting the engine. The photos show no sign of electricity generating equipment yet the car appears to have electric lighting albeit the head and tail lamps are not Buick. Nor are the 34×4.5 tyre wire wheels replacing the Buick standard fit 34×4 artillery wood spoke or wire wheels. 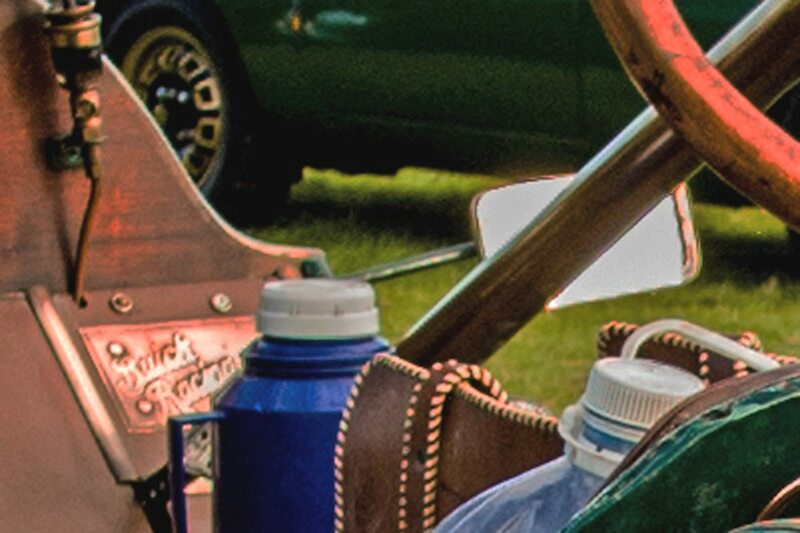 Other modifications noted are the fuel delivery requiring hand pumping to pressurise the fuel tank as used on the earlier race cars and the addition of friction shock absorbers fitted to the rear end. The build of this race car is very professional and follows closely the style and function of the prewar factory built Marquette Buick racing cars. All the modifications that are seen in the photos reflect the equipment used in that earlier period. A really interesting Buick that no doubt has a history that seems to be hidden by time.